A teenage boy on the cusp of finishing high school reconnects with the beautiful and mysterious girl next door for once crazy night. When she suddenly vanishes he and his friends embark on a strange and life changing journey to find her. 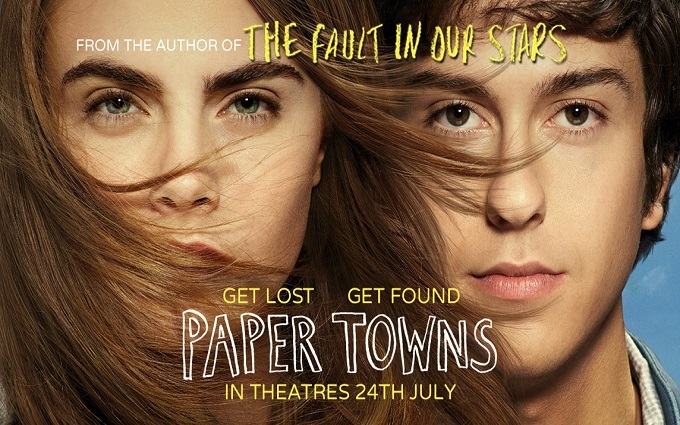 John Green reduced global audiences to tears with the painfully bittersweet The Fault In Our Stars, thankfully Paper Towns has a more whimsical and less tragic approach to teen romance. Green’s books translate well to screen and his knack for creating sincere emotions and drama remains firmly intact. Delevigne is cleverly cast as Margo , the films missing girl and mysterious holy grail. Her real life fame and notoriety lends her character an instant aura of intrigue and allure. It would have been far more challenging for an average unknown actress to achieve this in really just a handful of scenes. Nat Wolff gave a scene stealing turn in The Fault In Our Stars and this time he carries Paper Towns capably as everyman adolescent hero Quentin. His average boy next door appearance and deliberately awkward demeanour ensures he brings a credible reality to an increasingly elaborate adventure. In truth it’s actually the film’s supporting cast that prove its most effective surprise. Austin Abrams and Justice Smith play Quentins’s best friends. The convincing chemistry between this trio of likeable social underachievers is actually the real heart of the story. It’s refreshing and endearing to see a portrayal of teenage friendship that doesn’t resort to a lazy form of self-aware irony and witty cynicism. This isn’t just another batch of absurdly wise beyond their year’s high schoolers clearly written by adults. There’s actually something innately authentic and heartfelt about their good natured an unashamedly awkward co-dependence. The affectionate bond and playful banter between the film’s unlikely heroes adds both humour and heart to an already intriguing mystery. It makes it so much more enjoyable to join the characters on their literal and metaphorical ride. The combination of suspense and sentiment holds audience’s attention firmly. Though she serves as an effective catalysts for the films story, in truth Delevigne has surprisingly little screen time for a film largely being marketed on the back of her ‘it girl’ supermodel status. Likewise, her character Margo will be a convincingly alluring dream girl for some people, for others she will merely be infuriatingly selfish and irritating. The virtues of Delevigne’s on screen presence, much like her real life persona, will divide opinions dramatically. In truth there’s still not much evidence available yet to truly judge her acting prowess or potential. Nat Wolff is likewise promoted from scene stealing sidekick duties to leading man status. While his awkwardness is clearly an intentional character trait it does mean that at times he lacks a little charisma and personality. It’s unfair but inevitable to compare the romantic leads in Paper Towns with those of Green’s recent global box office phenomenon The Fault in Our Stars. Sadly the mostly missing Delevigne and the deliberately average Wolff can’t match that iconic level of heart-breaking romantic chemistry. Though the film does well to create a real sense of mystery and purpose, it builds to a conclusion that without being too specific won’t be universally satisfying. The film is exactly what it intends to be, but that won’t be to everyone’s tastes. Paper Towns is a sincerely sweet and pleasantly amusing romantic comedy, thanks in the most part to its enjoyable supporting cast. Delevigne’s mostly absent leading lady and the film’s conclusion will likely divide audience’s opinions, but aren’t enough to make them ignore the film’s other obvious charms.